A suggestion has recently been made that windmills which have served a Parish for years should be acquired by the local authority and kept in repair as monuments of the past. The idea is a good one. Fortunately, the mill which is such a feature the promenade is in good state of repair, and there no likelihood of it being allowed to go to rack and ruin whilst it earns its keep as well as it does. In windy weather the sails provide more power than is needed, but, like many modern windmills it is fitted with a gas engine, so that when the sails languish for a natural puff, artificial puff is provided, and the jolly miller’s wheels go round regularly as though it were a modern flour mill. For fifteen years Mr. William Swann has worked the mill, and never had the slightest trouble with hands for very good reason. There are only two of the latter in the place, and they both belong to Mr. Swann. In winter it is rather lonely, but like Paul, the miller has learnt to be content, and has quite affection for the place. In summer the visitors would prevent him from being dull if were so inclined, though his visitors have been considerably fewer this year on account the bad weather. There must be hundreds of address cards fastened up the wall, from all manner of people, including the High Sheriff of Belfast (Dr. O’Neill); the daughters of Col. Foster, M.P., of Hornby Castle; Gertie Sinclair, of Drury Lane; Mr. Charles Bertram, the famous conjuror; General French’s Staff Officer during the time of the Boer War; Mr. Louis Klein, a neutral Boer who came to England when the war broke out, etc. The millers as happy as happy can be. 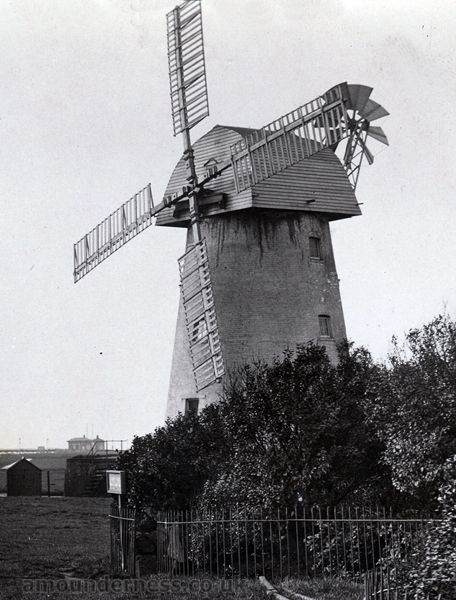 William Swann was the miller at Lytham Windmill between 1895 and 1919. 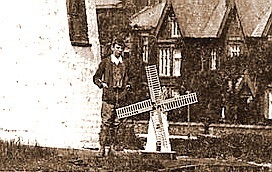 In his spare time he built models of the windmill; one can be seen on the photograph below. Soldiers on Lytham Green c1915 with the windmill in the background. 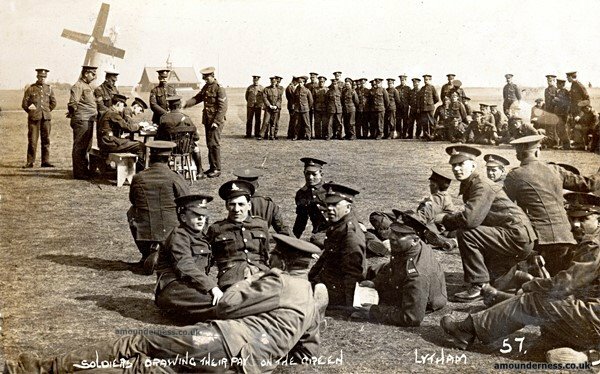 Thousands of soldiers from Lancashire Regiments were billeted in Lytham & St Annes during 1915 & 1916. Many drilled in the shadow of the windmill on Lytham Green and dug trenches on the beach in readiness for The Front. 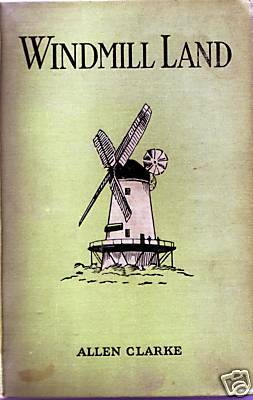 Windmills were fast disappearing from the English landscape and in 1916 Bolton-born Allen Clarke published “Windmill Land" which covered most of the Fylde windmills, past and present. "The appeal of the book is in its loving descriptions of the Fylde and its windmills, its people and its legends and traditions." It was reprinted in 1986 and is still a popular read. Mr. Allen Clarke’s “Windmill Land" (Dent and Sons, 3s 6d net) is rather nearer than its greater namesake, and lies only a few hours’ journey from Liverpool, in that part of Lancashire commonly known as the Fylde. Even here windmills are no longer the familiar objects that they were twenty years ago, and many of Mr. Clarke’s photographs perpetuate the memory of now vanished mills. He is a discursive writer, who effectively destroys the “guide-book” atmosphere by the insertion of much autobiographical matter, and frequent excursions into verse. One would imagine that Mr. Clarke bad quite exhausted in this volume his very considerable windmill lore, but it appears that has second volume is in the process of preparation. To those eager to obtain knowledge of the Fylde, and attracted by its local history, the book will prove an extremely interesting one. 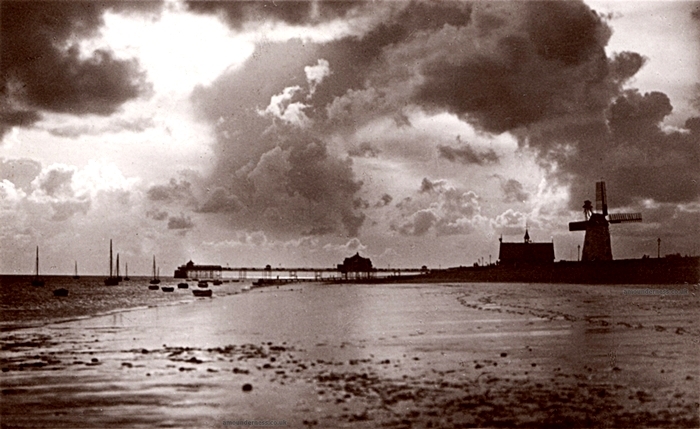 Photo from about 1908 of Lytham beach, windmill & pier titled "Storm Brewing". At the height of storm force gales on the night of the 1st & 2nd of January 1919 the sails of the windmill span violently out of control causing a devastating fire to start within the building. By the following morning it was completely gutted. The sails, which had first turned during the Napoleonic War, fell and smashed onto Lytham Green, less than two months after the end of the Great War. 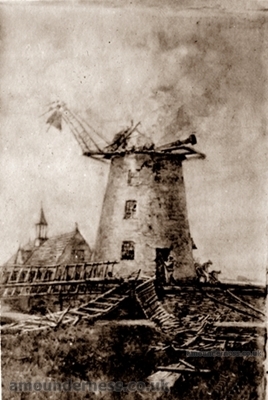 Lytham Windmill Destroyed by Fire. 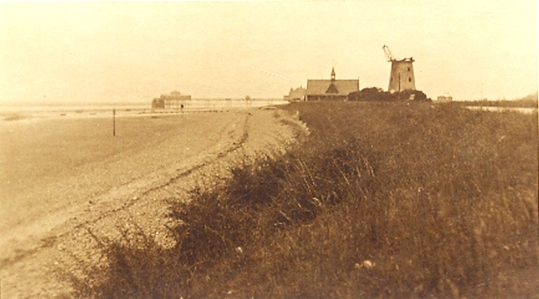 The gale at Lytham caused the destruction of the picturesque old windmill which has been the most prominent feature of Lytham's promenade for well over a century. The sails wriggled about and the friction of the brake set fire to the dry-as-tinder oak and pitch-pine beams. Over a hundred sacks of oats were destroyed, along with all the machinery, and the old mill was burnt out completely. The flames were seen from all sides of the estuary. Painting by Lytham artist, Walter Eastwood, of the smouldering windmill on the morning of 2 January 1919. 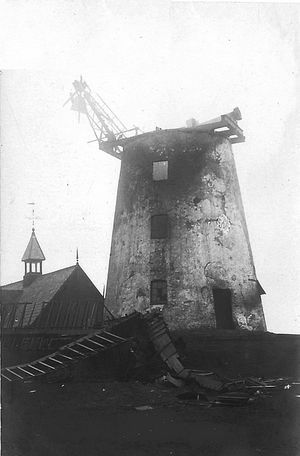 After the fire the windmill became a derelict eyesore and remained a forlorn sight blighting Lytham seafront for several years. 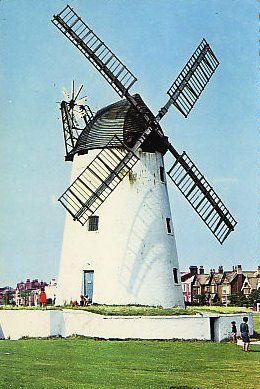 The structure was owned by the Squire of Lytham but windmills were obsolete and there was no financial gain in rebuilding. The outlook was bleak and demolition seemed inevitable. 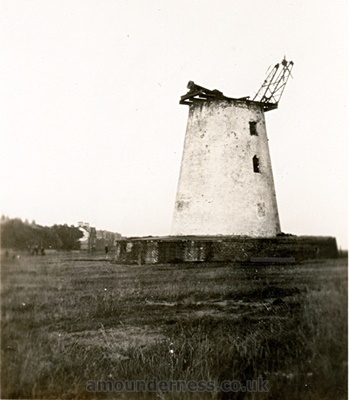 Lytham Windmill as it appeared in the early 1920s. 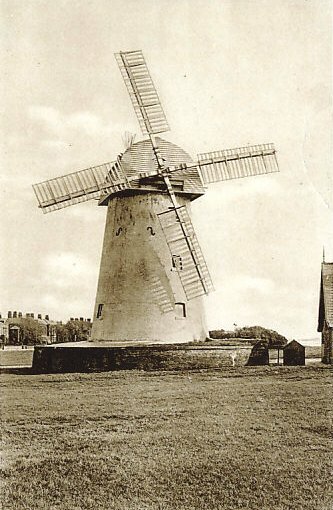 In 1921, probably due to the agitation by local residents, John Talbot Clifton, Squire of Lytham, gave the mill to the people of Lytham, or rather Lytham Council, which merged with St Annes Council in 1922. The newly created Lytham St Annes Borough Council restored the structure, fitting it with a new cap, sails and fantail. In this undated image the fantail is absent. The photo is thought to have been taken either during the 1920s restoration, or when repairs were made in the 1950s and 60s. Detail from the previous photo. Lytham Windmill & Lifeboat House, a 1920s watercolour by local artist, Walter Eastwood. 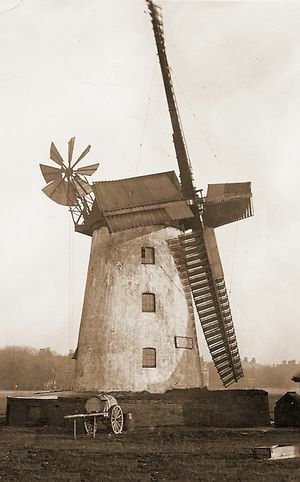 The windmill soon after the restoration was completed in 1924. A working mill for over a century it was almost lost. It was now an ornamental memorial to Lytham's past. Despite the restoration, there were still structural problems. In July 1926 "A zig-zag crack running about 8 yards down from the top of the brickwork" suddenly appeared, "the disturbed brickwork bursting outwards." Iron rods were used to bind the walls. STEPS TO BE TAKEN TO GUARD AGAINST A COLLAPSE. 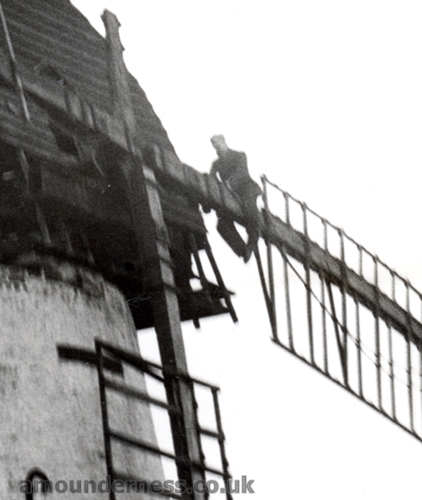 Fears are entertained for the safety of Lytham Windmill. A crack has developed in the upper portion of the structure, and it is understood that steps are to be taken to guard against the possibility of a sudden collapse. 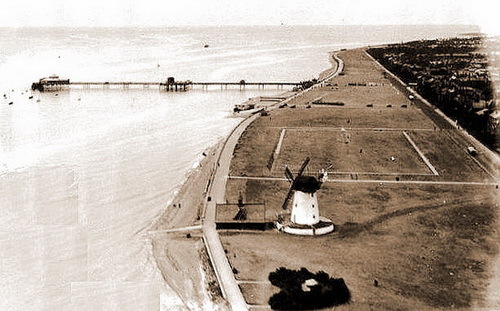 Aerial view of Lytham Windmill and Green c1930. A fire had destroyed the Pier Pavilion in 1928. 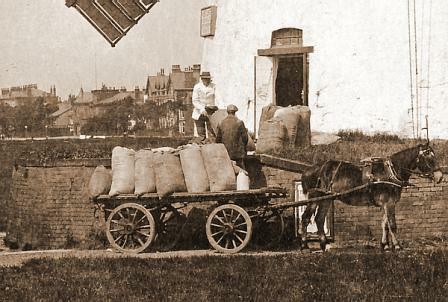 Photo of Ye Olde Windmill Cafe, Lytham, taken by Hedges c1929. 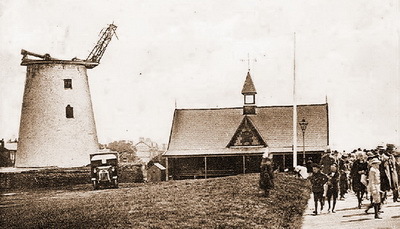 About 1929, in an attempt to recoup some of the money spent restoring and maintaining the structure, Lytham St Annes Borough Council converted the windmill into a cafe. It is said that it "did not prosper" but the situation probably wasn't helped when the signage was opposed by Mrs Clifton; her late husband had given the windmill to the Council a decade before. 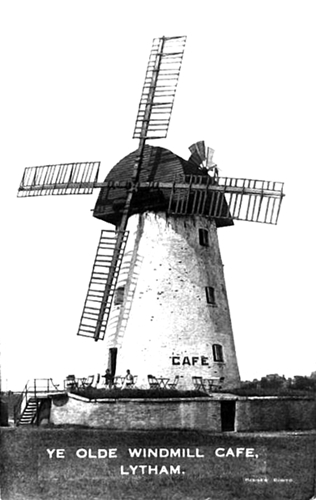 Some time ago Mrs. Clifton, of Kildalton Castle and Lytham Hall, drew the attention of the Corporation to a cafe sign on the old Lytham windmill, and remarked that the Clifton Estate would not have disfigured the mill by an advertising sign. This afternoon a recommendation came before the Lytham St. Annes Town Council to remove the sign. 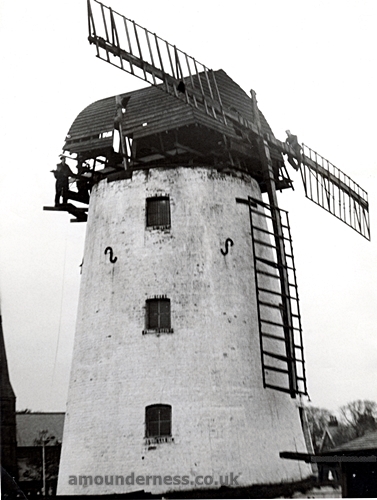 In 1932 powerful white floodlights were installed, illuminating the windmill on summer nights. Between 1932 and 1938 it was the headquarters of the Lytham St. Annes Motor Boat Club who transformed the lower room into a ship’s saloon. The reading room and the lookout over the Ribble was on the second floor. The windmill was used as a storehouse and electricity substation between 1938 and 1954. It then became the clubhouse for the northern section of the Ribble Cruising Club, the southern section clubhouse being at Hesketh Bank. 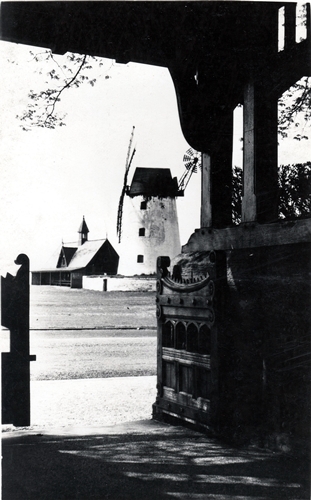 Photo by Cyril E Wilson c1950s with the windmill framed by the lych gate of St John's Church. The structure suffered severely from dry rot and in the 1980s it took Fylde Borough Council about two years to resolve the problem. 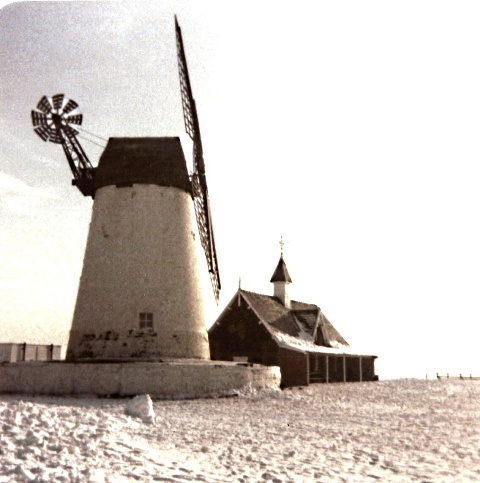 It was finally reopened on 20 March 1989 and now houses the Lytham Windmill Museum. 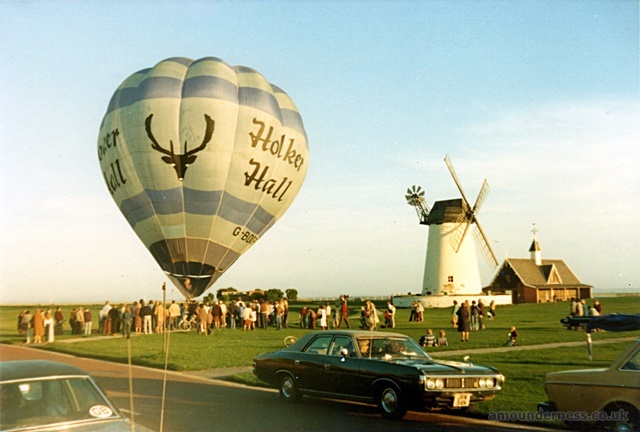 Undated photo of the Holker Hall hot air balloon on Lytham Green, probably in the 1980s. During a storm on 11 November 2010 one of the sails was ripped off the windmill by 100mph winds. This was followed by storm damage in October 2011. The repairs were carried out by Gillett & Son, Wesham.